The Mountain Cur is a medium-sized hunting companion presently utilized for hunting small-large game, ridding property of varmint and as a household guardian. They are credited with helping early settlers make home in the Appalachian Mountain region as well as other Southeastern states. These hardy dogs have few health concerns and are long lived, with this comes a necessity for daily exercise and jobs (hunting, patrolling, etc.). They are best suited for outdoor living in rural areas with owners who are active individuals (ultimate bonus to hunters). Mountain Curs are excellent family companions, get along well with other dogs and are easily trained. Housing them with cats and other small pets may be problematic. They require little maintenance but are not hypoallergenic. May be over protective of passive owners that have not established themselves as "pack leader"
Mountain Cur information provided by the UKC and CKC describe this breed as a compact, muscular and agile treeing dog. The head is broad and slightly wedge-shaped with high set ears and large brown eyes (that can range amber in lightness). The coat is thick and longer than many Cur types, however, it is still considered short. 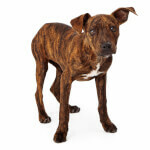 Common coat colors include: black, brindle, blue, yellow, red and blonde; the coats may include small portions of white. The tail may be naturally bobbed or long. Although they may independently make decisions on the hunting trail, they are intelligent, obedient and eager to please; most contend they can easily be discourage from unwanted behaviors. Training should focus on establishing the owner as the pack leader with firm, consistent commands, otherwise, they may become over protective. Early socialization is a must if these dogs are to live with cats or small animals and may not be successful still. Overall, this breed is easily trained by a first time owner. Mountain Curs have high protective instincts and, although not aggressive dogs, have been known to protect their owners from threats as large as mountain lions! They will certainly be watchful and aren't shy of raising an alarm. To friendly people, they will be friendly in return and they do very well with children and other dogs. This breed enjoys being outdoors and thrives most on a large property or, at the least, a large fenced yard. They will actively patrol the home and property, ridding it of vermin and alerting you when necessary. Their absolute favorite activity is hunting, as this is where their origins and natural aptitudes lie. If you keep this breed indoors, they will certainly need at least an hour daily outdoor activity to avoid becoming bored and destructive. When European settlers landed on the eastern coast of America in the 13th century, they brought with them dogs native to whichever lands they came (for example British Terrier-types and Spanish bobtail Curs). These dogs intermingled with native Cur types to produce dogs that were excellent hunters and guardians. This allowed these settlers to migrate down into the Appalachian regions and states like Virginia, Tennessee, the Carolina's, Kentucky, Alabama, Mississippi, Louisiana and later Oklahoma and Arkansas. Members of this breed hunted game for the family to eat as well as protected them from large predators in this mountainous new terrain; they were so essential for survival they families treated them as prized possessions with puppies often riding on the pack animals along with other family necessities. Until the 1940's many Mountain Cur were still providing sources of income for their families from animals that had been trapped and the furs sold. Then WWII came and, with it, the necessity for multitudes of men to leave their homes and farms to become soldiers, then many women left to replace them at factories and other jobs previously not available to them. This left the breed in a state of decline with attention focused on other needs and no use for them in urban areas. In 1957, four dedicated men organized the OMCBA, the Original Mountain Cur Breeders Association and recognized the Mountain Cur as a distinct breed. Although two of the members are rumored to have split due to controversy over the breed standard, they still managed to bring this amazing breed back from near extinction and increase its popularity greatly. Black Mountain Curs may have Tan or Brindle points and any color individual of this breed may include small amounts of white. This breed is not to be confused with the Black Mouth Cur, which is somewhat similar in appearance but does not typically display the same range of coat colors. Mountain Curs are medium sized dogs; females are 16-24 inches at the shoulders while males are 18-26 inches. 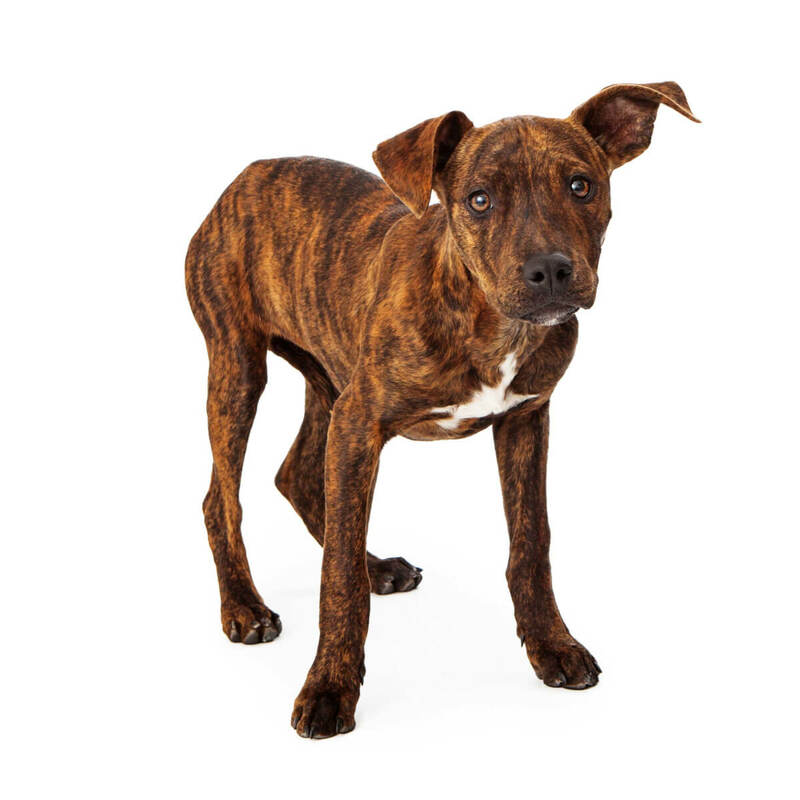 The weight of this breed tends to fall anywhere in between 30-60 pounds, however, Mountain Cur weight and height are not held so strictly to a standard as some pure breeds. They are muscular and sturdy dogs bred for hunting functionality rather than a pretty appearance, so the weight should be proportionate to the height. Mountain Curs are purebred dogs but will still vary slightly since they are not bred strictly to an appearance standard. These scent hounds are bred for work and, as such, proportionality will be more important than uniformity. As with many breeds, there are those that claim one strain/bloodline is superior to others-- two such popular bloodlines include Carl Smith Mountain Curs and Busher Bred Mountain Curs. Several of these bloodlines have even developed into their own breeds (ex. Kemmer Mountain Cur). 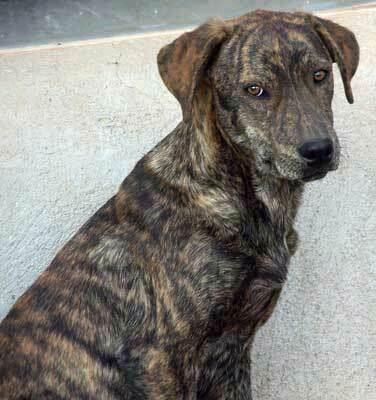 An interesting side note, some Mountain Cur types are born with bobtails while others have naturally longer tails. This is where the term "cutailed" comes from-- meaning to "reduce in extent or quantity". The Mountain Cur temperament is surprisingly versatile allowing them to be tenacious hunting partners as well as dedicated family companions. They are intelligent, eager to please, loyal, protective, hardworking, friendly, playful and energetic! Most often, they are used for hunting varmint and treeing small game but these dogs are so courageous that they can also track larger game such as wild boar; stories even abound of Mountain curs protecting their owners from large wildcats. This brings us to protection... these are friendly dogs that are not shy, however, if they feel you need to be protected they will do so-- especially if the dog doesn't recognize you as the pack leader. They are not usually aggressive so visitors and friendly strangers needn't worry about all the commotion they are likely to raise. 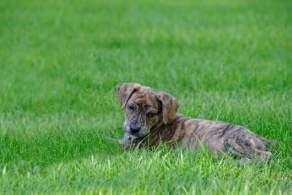 Although the Mountain Cur personality is generally obedient and eager to please, training them early to see you as the pack leader is necessary since, otherwise, they may become over protective. Training should be easy if you do so with firmness and consistency. They usually get along great with kids and other dogs but they will retain strong prey instincts towards smaller animals, especially varmint like creatures. Socialize them early with any cats they may live with. 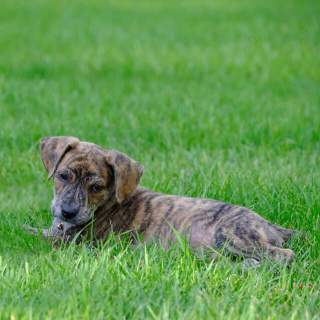 Below are pictures and images of the Mountain Cur dog breed. These hardy dogs are quite versatile making both excellent hunting companions as well as excellent family companions. They are not usually aggressive unless they need to protect you in an extreme circumstance but they certainly will bark at anything they believe needs attention-- which might displease close neighbors. You will most definitely need to keep this breed leashed during walks as they have a burning desire to hunt and will tear off after small animals. Members of this breed are versatile and are said to make excellent family companions. It is ideal for them to live outdoors where they can exercise their natural hunting and guarding instincts. If you insist on keeping them indoors, however, it is a MUST that they get enough exercise of they may become bored, anxious and destructive. Due to a short coat, they shouldn't be kept outdoors in extremely cold/freezing climates. Also, unless you have a large property and no close neighbors, your yard should be fence or you may find them a block down with your neighbors cat treed! Mountain Curs have slightly longer coats than many other Cur types, however, they are still considered short-haired. That being said, they are not hypoallergenic and you can expect them to shed a normal amount. If kept outdoors, this breed should not be a big problem for allergy sufferers. Mountain Curs are certainly a commitment (as far as longevity is concerned) as many will live 14-16 years. They are a robust little breed that, if given plenty of exercise, will remain in good health. In fact, there is little information about diseases and disorders for this breed; this may be due to them being bred for functionality more than appearances. As with all breeds, don't skip the routine veterinary check ups and, if purchasing from a breeder, ask for proof of health for both the parents and the puppy.